In 2015, Alyce finally decided what her goal with the peaches would be: “To deliver the very best quality peach I possibly can, grown as close to the natural way as possible.” It is a decision that she is very excited about and that has given her a completely new outlook on the whole peach-growing idea. Historically, Florida Peaches were developed to meet the niche between Chile and Georgia, so Hilltop Peaches’ harvest season is usually April and May. Alyce loves the Downtown Market and plans to bring her peaches every Saturday during the season for years to come. How long have you been in business? We planted peaches in 2011. Our first commercial harvest was in 2013. How did you get started? We planted peaches previously on citrus land we own. What kind of products do you offer? 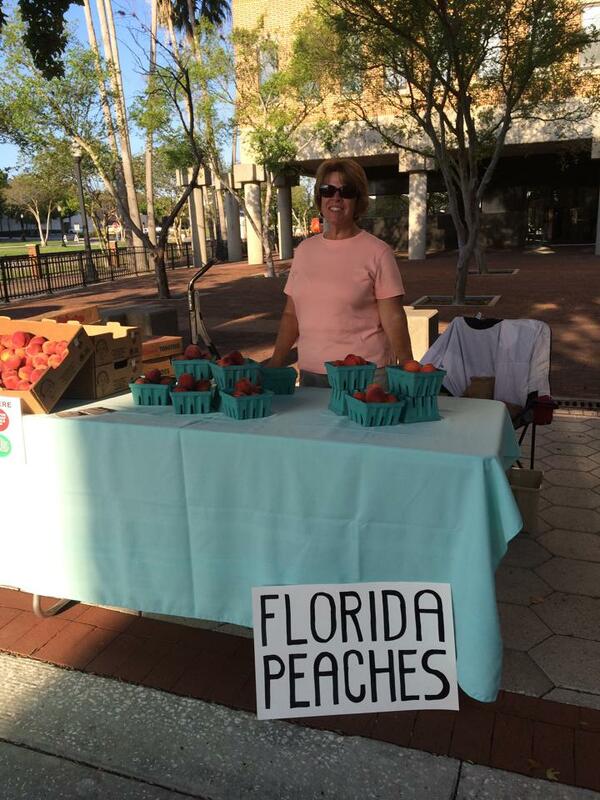 We sell fresh Florida peaches developed by the University of Florida. Our varieties are UF Sun and Tropic Beauty. What’s one thing that your customers might not know about you? I retired from office work in 2008. I now work harder than I have ever worked in my life–physical labor. It’s all good! What’s the best part about being at the Market? Visiting with customers and hearing how much they love the peaches. What’s one goal that you have for your business? I want to continue to harvest good peaches, always trying to increase the size with bloom management and pruning.